Unfortunately I didn’t have any on me, but we were in a craft store with paper and markers around. I used a sheet of paper that they have to test markers and gave her my info. This exchange gave me an idea – if I could give her different ideas to make invitations, why shouldn’t I make some and add them to my shop? So last night, I did a mock up for a tea party invitation. I think that it came out really cute. Here it is – what do you think? Thanks for stopping by! Feel free to leave comments or questions and subscribe to my blog and my YouTube channel! Be sure to check out my Etsy store for all the new designs I will have coming. 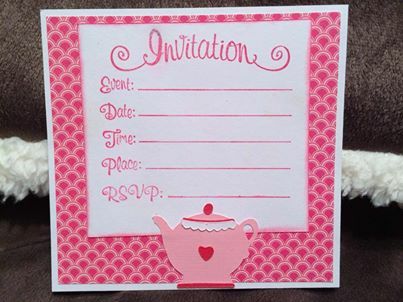 Posted in Uncategorized and tagged Etsy, facebook, handmade invitations, heart, invitations, invitations with matching envelope, pink, Pinterest, red, scrapsecrets, tea kettle, tea party, We R memory keepers, white, YouTube. Bookmark the permalink. Since sales on Etsy are slow and shows this time of year aren’t as well attended as the fall, I am trying to find other avenues for my business. I have a couple of ideas to add to Etsy, but I also have one that has nothing to do with Etsy. I need some feedback from all of you who read this blog. Ahhh – Market Research! I feel like I’m back in my marketing classes in grad school! First I’ll do my Etsy ideas. For all my teacher friend, I was thinking about selling bulletin board designs. Maybe apples for the beginning of the year so that the teachers can write all the kids’ names and then other designs for different times of the year. Maybe snowflakes for winter and then flowers for spring? I was thinking of making them in packs of 25 with the option of adding additional ones for a small fee. I also was thinking of adding a personalization option – I would add the kids’ names for a small fee too. Not sure if that is practical or not. Thoughts? My next idea for Etsy is to add scrapbook pages. They will be pre-made and either sold as a package or individually. These will be easier since I have done tons of scrapbook pages – I just have to pick a couple of occasions and then pricing. (You can see I have done my research – lol. I actually just started thinking about some of these options!) Again – thoughts? I have a couple of other things in the works, but I’ll save them for another post! As far as the true new business idea, if you follow me on Facebook, you already know what it is! I want to expand and do a mobile part to my business. I’d like to do birthday parties where the kids come and make something. So far my ideas are to either have all of the attendees make a scrapbook page for the birthday girl (or boy) and then she (or he) will have a unique gift from all of their friends. They pages don’t have to be filled with pictures (although they can be added later). The kids can also make cards or paper dolls that look like them. All of these decisions would be made in advance so that I would know what to cut and bring. It also depends on the ages of the attendees how detailed I could get with their projects. So, does anyone have any suggestions or comments on any of my ideas? Good? Bad? Not thought out enough? (I know the answer to that one ha). Feel free to leave comments and suggestions below. I welcome all (constructive) criticism as well as ideas! Posted in Uncategorized and tagged birthday party ideas, bulletin boards, Etsy, making cards for kids, making paper dolls, market research, new business ideas, scrapbooks for kids, selling scrapbook pages, teacher bulletin boards, teachers. Bookmark the permalink. I recently bought from Simon Says Stamp online and then from a new Joann’s store. In my day job, I got a bunch of new stores and by one of them was a brand new Joann’s. It was the largest one I’ve ever seen and it was awesome. My local store only has maybe two aisles of scrapbooking items. This store, however, had as much as my local Michael’s or AC Moore. (If you want to see the video from the hauls, go to my YouTube – chelebelle). SInce I bought ALL of these new supplies, I decided that I needed to use some of them to create some new projects. So I did! I made four cards (three from supplies I bought in those hauls). The first card is a kraft card base that I used Tumbled Glass distress ink and a stencil from The Crafter’s Workshop to create a swirled background. Then I used the same color ink and stamped a GIna K Design sentiment stamp on a piece of white card stock and attached it to the front of the cardbase. I added three small teal colored gems to the bottom of the sentiment piece. The second card was made from black card stock. I then cut a piece of white cardstock a 1/4″ smaller and inked the whole piece up in three colors of distress ink – Tattered Rose, Picked Raspberry and Worn Lipstick. I did the same to a smaller piece of card stock so I would have another layer for the top of the card. I took the larger inked up piece and ran it through a Lifestyle Crafts embossing folder that has roses on it. After that I sprayed some glitter mist on it for a little shine. On the smaller piece I stamped the two birds with a heart above them from a stamp set from Joann’s (Fiskars I believe) and then matted it with some black card stock. The third card I made was using the “XOXOXOXO” die from Simon Says Stamp. I inked up a piece of white cardstock with chipped sapphire, dusty concord and milled lavender distress ink and then ran the die through my Cuttlebug to create a bunch of ombre strips. I also used a black cardbase for this card and covered the top with some white and purple washi tape. Then I placed a “XO” strip under it and alternated them to the bottom of the card. The final card comes from another exclusive Simon Says Stamp set. This one is a stamp and die set, which I am really loving. The centers of the “O’s” from the above pieces were used to create the polka dot background of this card. I glued them down onto the white card stock and then cut another piece of white cardstock from the Nestabilities die. I used the same three colors of distress ink to color in the background for the bra and hanger to sit on. I stamped the bra in two shades of Hero Arts Shadow ink (Pool and Tide Pool I believe). Then I used the dies to cut out the bra, hanger and the bow. The last step before putting the card together was to cut a small piece of white card stock for the sentiment. I stamped it with the two colors of the bra. Here is a picture of all four cards, which will hopefully be going up on Etsy soon! Posted in Uncategorized and tagged birds, bling, blue, bow, bra, card designs, chelebelle1120, chipped sapphire, distress ink, dusty concord, gems, Gina K Designs, hanger, haul, hearts, Hero Arts shadow ink, Joann's, Lifestyle crafts embossing folder, love birds, milled lavender, picked raspberry, pink, polka dots, Pool, purple, Simon Says Stamp, stencil, teal, thanks for the support, The Crafter's Workshop, Tide Pool, tumbled glass, worn lipstick, XOXOXO Simon Says Stamp die, YouTube video. Bookmark the permalink. Usually one of the first things I do when I wake up is check my email. So, today, I did that like I do almost every day and saw something awesome. I got an email from Northridge Publishing saying that they wanted one of my designs to publish in their June CARDS magazine!! I was so excited. Now I have to fill out their form and send it back with the card and a picture of the original submission I sent to them (so they know it’s the same card that they chose). It’s such a great feeling of validation, knowing that someone, somewhere likes your work. It’s the same feeling I get when someone buys something of mine off of Etsy or at a craft show. Or even better, when someone asks for a special request from you and then tell you how much they love it. Okay – I am off to fill out the forms and send my card so they can get it by the 20th. Posted in Uncategorized and tagged CARDS magazine, design in a magazine, getting a card published, getting your work published, how to get a card published, Northridge publishing, submitting a design. Bookmark the permalink. I was designing some new cards yesterday and I used the Simon Says Stamp numbers dies to cut out a bunch of numbers for the front of the card. The sentiment said on a 1-10 scale you’re an 11 (or something to that effect) so I thought it would be cute to have numbers floating around on the background. I took my dies and cut the numbers out of patterned paper. THen, I had to glue each one to cardbase individually. After I was done that, I thought I might try some washi tape on the front to hold the sentiment down. I decided against it because it didn’t look right. But then I thought, why not use washi tape to cut the numbers instead of card stock? This way I can skip a step as they would already be sticky enough to just put on the card front? Genius! Why hadn’t I thought of this sooner? I use washi tape to hold dies in place in my Cuttlebug, but never did I think to cut things out using the tape. So, I started a little experiment. First, I used my thicker washi tape because the thinner rolls weren’t wide enough to cut the whole number out. I used my Genius platform (no pun intended!!) and stuck the die down to the base so that the cutting blade was face up. Then I put the washi tape over the number 3, sticky side facing up. After I ran it though the Cuttlebug, I nervously lifted the top off and saw it cut through. Success!! I essentially had a sticker “3”! So, then I decided to be brave and try the die from Simon Says Stamp that says “baby”. It’s a very intricate die and a little wider than the washi tape so I put it at an angle. It wasn’t staying put so I used some smaller pieces of washi tape to hold the tape down. Unfortunately, the results weren’t as good as the first time. Since the die was so delicate, it was tough to get the washi tape off the top of the sandwich. The washi tape tore a little. Using washi tape and dies in the Cuttlebug is something I will experiment with again. I will try it with less intricate dies, like the numbers and border dies to see the results. I haven’t actually made anything with the washi tape, but I plan on it! It was a fun thing to try and I encourage you to use your supplies in a unique way. You never know what you will come up with! Posted in Cuttlebug and tagged creative use of supplies, Cuttlebug, dies, intricate dies, number dies, Simon Says Stamp, using supplies in a unique way, using washi tape to cut out dies, washi tape, word dies. Bookmark the permalink. Well, Happy 2014 everyone! I hope that this year is a great one. Last year was a tough one for my family. We lost three family members in less than three weeks, right before the holidays. There were also some more personal losses I suffered this year, but I am hoping that 2014 is a turnaround year! Especially professionally. I have been struggling with work since I came back from being on disability. I just don’t seem to have the passion for it and I long to be home, creating things for my other business. But since I can’t live off of what I make from there, I need to try to rekindle some fondness for my job before I become completely miserable. I am also working on some baby albums for my Etsy shop. I searched Etsy this morning to see what was available and I couldn’t find anything like what I wanted to make. This can either be good because I could fill a void or it could be terrible because no one wants them! But, instead of doubting myself, I am going to go ahead and make it and see what happens. Who know – it could be a hit! Posted in Uncategorized and tagged baby albums, baby book, bridal shower tags, bride and groom thank you tags, Christmas tags, Etsy, favors, new designs. new ideas, new projects, New year, scrapsecrets, shop, tags, tags for presents, wedding favors. Bookmark the permalink.